Red Valve’s Series 42 Pressure Sensor and Series 742 Diaphragm Seal isolate and provide accurate instrument reading of gauges, transmitters, and pressure switches, making them ideal for use in chemical or slurry service. The Series 42 and Series 742 can be mounted in any flow direction, and have threaded ends manufactured to standard NPT pipetap dimensions for smaller pipelines. The principle of operation is simple. As process pressure is sensed by the 360° elastomer sleeve, the captive fluid transfers the process pressure to the instrument, providing a consistent, accurate reading. The Series 742 offers a significant advantage over traditional diaphragm seals. When installed perpendicular to the pipeline, the Series 742 can be isolated so that in the event of plugging, the elastomer slurry ring area, which isolates the instrument, can be flushed or rodded clean. 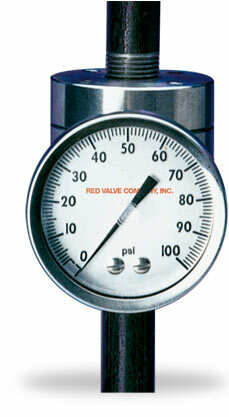 Series 42 Pressure Sensors and Series 742 Diaphragm Seals are available in sizes ½” through 2”. The Series 42 features a tip-mounted gauge, while the Series 742 is supplied with a standard back mounted gauge. A complete Series 742 Diaphragm Seal, including optional isolation ball valve, is available for immediate delivery.